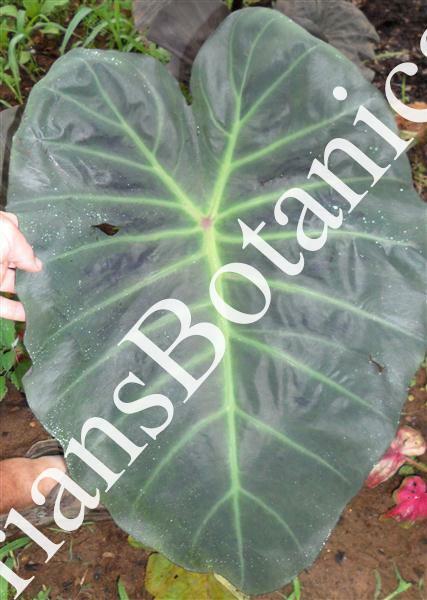 Colocasia Maximus Gigante?PP28,001 is great new addition to the Gigantes series we have released. This hybrid produces large long leaves 3 to 4 feet long and 2 to almost 3 feet wide. Each leaf is dark green with large blotches between the veins. The veins are usually a light green and may have pink to purple in the new leaves. The older leaves will have a red to pink spot in the center of each leaf. Once mature plants grow to 4 to 6 plus feet tall.